Heartsaver classes are for non-healthcare workers with limited or no medical training who need CPR/AED/First Aid certification for a job or other requirements. Typical students in Heartsaver courses are child care workers, teachers, foster care workers, camp counselors, youth organization leaders, and coaches. This course is also ideal for parents, grandparents, babysitters, guardians, and the general public. High school students are welcome in our classes, but please be above the age of 14. 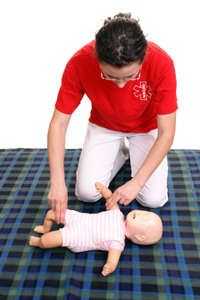 The full Heartsaver First Aid CPR AED course in 7 hours of instructor-lead classroom training. The cost for the instructor lead program is $150. There is no required written test for this class. Upon completion of the class, students receive a Heartsaver First Aid CPR AED course completions card that is valid for two years by the American Heart Association. The blended Heartsaver First Aid CPR AED course has 2 components: an online portion and an instructor-led classroom portion. Go to http://www.onlineaha.org/ to complete part 1. The fee for Part 1 is $30. Upon completion of part 2, the skills portion, students receive a Heartsaver First Aid CPR AED course completion card that is valid for two years by the American Heart Association. The cost for the skills portion of the course is $99. Please go to our Schedule & Sign-up page to see dates or to register for a class. Privacy Statement: Thank you for visiting www.CPRWORLD.org. We are committed to protecting and safeguarding your privacy. The information we collect about you when you visit our site is private and will not be shared or sold to any other company or person not directly affiliated with CPR World. American Heart Association Disclaimer: The American Heart Association strongly promotes knowledge and proficiency in all AHA courses and has developed instructional materials for this purpose. Use of these materials in an educational course does not represent course sponsorship by the AHA. Any fees charged for such a course, except for a portion of fees needed for AHA course materials, do not represent income to the AHA.